I like the cut of Not Doppler’s jib. Their stable of 2D games are all solidly entertaining games with zippy gameplay. Their most recent game, Earn to Die 2($0.99), is the first time they have revisited one of their iOS games with an update. From a bird’s eye view, this one is really strong, avoiding some of the pitfalls other popular games have stumbled into. Some of the best decisions made are that the follow up game has more content and maybe most importantly, this one was packages as a separate game independent from the first Earn to Die($0.99). Once you get a little closer, you’ll find there is even more to get excited about. Earn to Die 2 is a game all about a man and his ride. Unfortunately his ride needs some upgrades to deal with an army of boxes and zombies that are in the way. He might also be trying to drive to Florida to get to an evacuation point, because of the zombie thing. In order to make progress towards his goal, your driver man must upgrade his car until he can reach the next check point. Occasionally he will also get a better/cooler car in which to continue the upgrade process in. 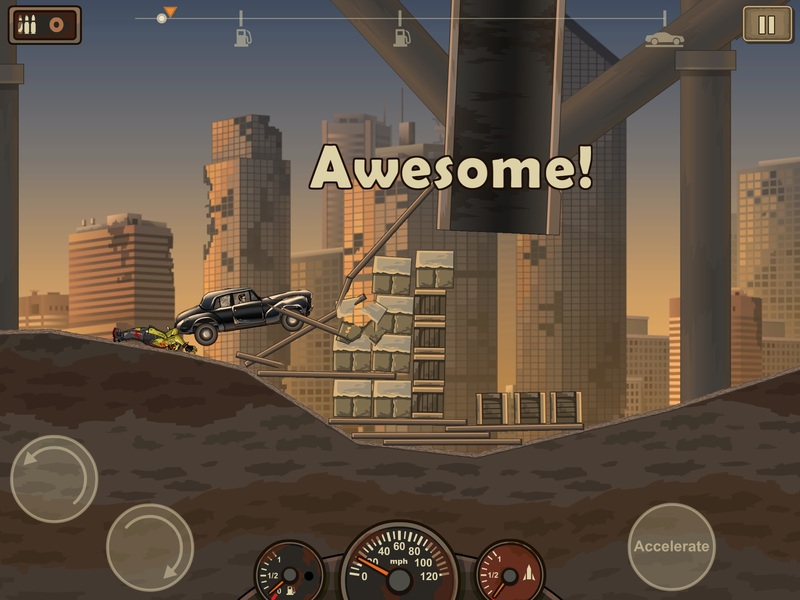 Gameplay is based off of the old tried and true physics motocross browser sims that have seen some pretty solid iterations on iOS, not the least of which is this game’s predecessor, Earn to Die. This isn’t a game that was loosely tacked onto a physics sim. Even though the story of Earn to Die 2 isn’t exactly cinema quality, the premise is solid enough to carry itself onward. Between car upgrades and kickin’ rad rock riffs I have to feel a little like I am Kurt Russel trying to escape a certain west coast city. With zombies. What surprised me the most is that the tiny little baby steps you make in getting just a little further each time you venture out are a really strong hook. I’ve found myself losing sleep trying to stretch just a little more to make it to the next gas station. Those victorious rides that make it to the next leg of your journey are usually fast paced, action packed, and pretty tense until you reach your destination. So what’s new in this sequel? Well the game now has multiple paths you can take that will affect how far you can go. Your vehicle also takes battle damage and the engine can break if not properly protected. The road weary traveler is also taking a more urban route to his rescue point this time around. While much of the original game’s content is borrowed, the difficulty has been ramped up, along with the overall length of the journey. What this results in is more play time and content this time around. One big feature getting hit by the spotlight is that the story mode is five times longer than Earn to Die. I’m not 100% convinced, however, that this is really a good thing. Once you have maxed out a few vehicles, gameplay begins to stagnate quickly. Regardless of vehicle size, each one handles like you are driving a motocross bike. While that is a novel thing that gets pretty goofy, I would have liked to have seen a little more attention to physics just to mix things up and maybe some more varied terrain. For the most part, you will be driving up ramps, driving down ramps, and hitting free falls. It would be really cool to have to deal with big jumps and maybe even some situations where you need to square your wheels to diagonal/vertical surfaces in order to come out of a set piece intact. Additionally, the only thing that is going to meaningfully impact the distance you travel is the number of upgrades you have. I would have liked to see some sort of skill involved in how far you get, but as long as you are hammering on the gas you are probably going to end up within 5% of the maximum distance your upgrades will allow. I think there is a lot of room to expand on the current state of the game. A trick system(maybe with the improved terrain idea) that awards extra fuel for hang time, flips, or other skill related things would be awesome. A gun that you can control to take out ‘special zombies’ that would otherwise kill you or steal all you gas would also be an amazing change. Anything that can make day 96 different than day 33 other than a new ride might also be nice. Maybe some legs of the trip could even be a nitro boost level that forces you to travel at max speed and try to avoid things before your engine blows. With the advance we’ve seen from E2D 1 to E2D 2, I think the future looks pretty bright for this game franchise, and there are some areas they could pretty smoothly transition into. In the mean time I’m gonna go back to mashing up some zombies(and boxes).